Even with the rise in single-parent families, most children still live in two-parent households. Depending on the state, anywhere from 53 to 79 percent lived with two parents in 2011, according to the national KIDS COUNT program. Although many children raised in single-parent homes become successful adults, studies shows that children living in well-functioning, two-parent families have several advantages. In a 2009 study published by Cornell University, researchers reported that children living with married, biological parents have lower levels of risk-taking behaviors. When compared to single-parent and step-parent families, these children reported lower levels of substance abuse such as smoking, drinking and drugs. Less likely to be sexually active when young and more likely to have long-lasting romantic relationships, children in this study were also more likely to start families at an older age and when they were married. 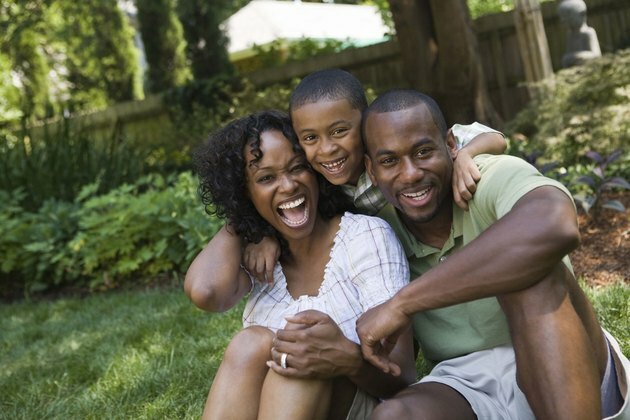 Living with two parents can lead to better health. Based on the results of the 2003 National Survey of Children’s Health, children living with two biological parents or in a blended adoptive family were healthier than children living with grandparents, single moms or step-parents. They had excellent or very good physical and dental health and fewer injuries requiring medical attention. In addition, these children were less affected by asthma and frequent headaches and less likely to miss more than 11 days of school due to illness. While nearly half of all single-mom families live in poverty, economic distress affects only one in 10 married families with children. Two-parent households tend to live in better neighborhoods and their children attend better schools. The economic impact continues into the college years. In a 2005 doctoral dissertation, Peggy Brandt Brown found that while 33 percent of students from single-parent families expected more than $25,000 in student loan debt upon graduation, only 22 percent of students from two-parent families expected the same rate of debt. Your supervision and support directly enhance your child’s well-being. When compared to single-parent families, two-parent households more closely monitor their children's behavior, knowing who they are with and where they are. According to the Policy Institute for Family Impact Seminars, this type of monitoring is a powerful predictor of whether children participate in problem behaviors. Two-parent homes also tend toward more involvement in their children’s schools and express higher educational goals. When combined, monitoring and educational support account for a 20- to 40-percent increase in the well-being of a child raised in a two-parent home, when compared to a child from a single-parent family. Cornell University’s Community &amp; Rural Development Institute: Are Both Parents Always Better than One? . . .
Educationally At-Risk College Students from Single-Parent and Two-Parent Households . . .